Complete new bigger&better scans of the same comic uploaded many years ago. 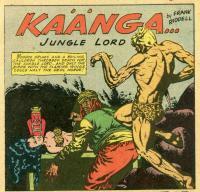 Synopsis: Kaänga's arbitration of a dispute over an idol is not received well by the cliff people who steal the idol and Ann, with the intent of sacrificing her to the idol. Kaänga and Dorna, a cliff people girl that he once saved, prepare fireworks that frighten the cliff people allowing Kaänga to rescue Ann and retrieve the idol for the valley people. Synopsis: After the death of Haj Abdu, Ko comes to believe that Wambi is the rightful heir to the village throne. 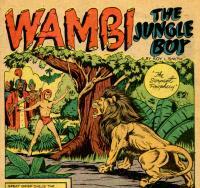 He plots to kill Wambi on a lion hunt but Wambi is saved by the intervention of his jungle friends. Synopsis: Simba tricks his latest rival, Chonga the Cape buffalo, into falling into a tiger trap dug to capture Simba. Synopsis: Brief natural histories of the wombat, the koala, the great kangaroo, the gray possum, the spotted cuscus, the flying squirrel, the Tasmanian wolf, and the dasyures. Synopsis: An old hermit casts spells that shrink men and animals to a tiny size for his own amusement. Tabu restores the animals to their original size and they kill the hermit. Synopsis: Terry arranges to settle a land dispute by having the leaders race camels to decide who gets the lands. Synopsis: A group of bandits raids caravans in order to get slaves to build their fortress. Camilla manages to free the slaves and acquires a pet dog.